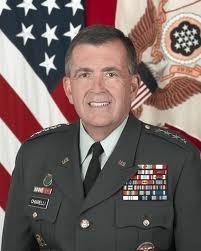 Four-star Army Gen. Peter Chiarelli — the number two general in the U.S. army — says he is absolutely not offended that Obama adviser Valerie Jarrett mistook him for a waiter at a fancy Washington dinner this week and asked him for a glass of wine. 1. Black bow-tie (an $8.95 standard-issue bow-tie is mandatory at formal functions*) with the tailored uniform — who else but a waiter? 2. Yes, and it probably wasn’t the first glass of wine that she’d ordered that evening by a long shot. 1. What was he wearing? 2. How drunk was she?